Mydreamplus--- co-working space co-founder Mr Wang is proud, they are preparing for the new momentum of China's economy and for all the future decades of SME groups doing their valuable and significant things. "Small and medium enterprises in the next five to ten years will grow more and more. The next five to ten years is the real Spring belonging to the small and medium companies - and the freelancers. Their office needs are a much more specialized demand for institutions to meet." Mr Wang told our Harper's Bazaar man. Throughout the reform and opening up China's economy and the development of office administration, beginning with foreign companies who brought the most advanced forms of production and office, followed by the State-owned enterprises, the rise of private enterprises became the first engine for economic development. Shared offices seems to be yet further momentum in the Chinese economy boom, and for the process of transition from the old to the new. What changes will "The Internet + Office" bring? 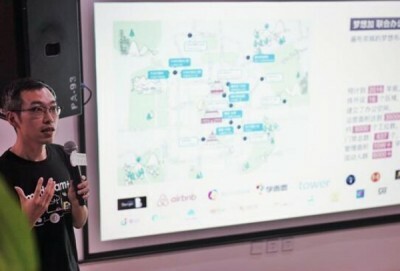 In the view of co-founder Wen Mengfei, Mydreamplus plus builds on the sharing economy concept. "The real economy should be driven by science and technology. We hope to be able to use coding to solve the problem, to try not to consume more human resources, so that it would exceed the scale of the border. For example, our Mydreamplus developers have created an independent system which can allow our administrators to remotely grant booking acceptance, workstation distribution, manage team attendance, and distribute office resources using real world data. In return, each of our clients are individually certified, allowing them to sweep open a door with a QR code, reserve a room, or print documents, as based on their office needs. This intelligent combination of hardware and software systems - such as the meeting room and its occupants - joins each together through a mobile network connection, realizing effective joint office space management and resource allocation. It is an advantage that has seen a growing number of people take up: Tencent has recently been rolling out this new approach to its public spaces all over the country. In service aspects, Mydreamplus has added by provide of enterprise service more from Yu settled company, currently cooperation party including Tencent cloud, and UCloud, and fast method works, and easy background, and easy Express, and BOSS straight hired, and home dinner, and love big kitchen, and Le pure yogurt,, dream added will will put these enterprise provides of tax, and financial, and recruitment, and method works, service to gift package of form push to settled team. So, Mydreamplus hardware and software is more like a Windows operating system, that can host data flows whilst the companies, organizations and individuals are the data. All enterprise services, individual service providers can access the system, and through continuous analysis of data share physical resources. As assigned to the company or individual, you can do absolutely anything "bag check" and does not need to expend the effort for some tedious thing. Mydreamplus aims to promote life, and to that end, the entire office space and every detail reflects the "people-oriented" core concept. For example, independent offices can regulate the height of their work station, or there are other sizes available including a specially designed stand-height desk. Seats are designed with a sense of fun, some are swings, others are orange cubes. Glass partitions allow light, but are also there for flexible arrangement. It can be offices, or it can turn into a big classroom for large activities. This open and efficient office environment, makes different the company both independent, and open to various forms and fusions. 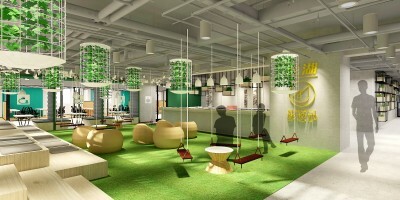 Mr Wang believes that a good atmosphere will improve overall efficiency of the office, and set off a chemical reaction leading to the office of the future. "We tend to do things by themselves as the ‘office of the future’. This space does not belong to the normal nine-to-five work hours. It can also be used for rich after-work activities, including recreational, social networking, learning, relationships and other aspects of the content." Although "mass entrepreneurship, and innovation" are one of the current major trends and office space can be found everywhere, Wang feels most don’t offer enterprises the level of detail and flexibility that they require. Since its founding intentions, Mydreamplus is not focused on selecting good companies to invest in, but is instead focused on the office. It looks to upgrade its hardware and software space as a whole, and to promote internal communication between enterprises. And in this age of the Internet, you should always believe that efficiency creates value.